Best practices and standards are the foundation of quality care. Meeting the basic health and safety needs of all children sets the stage for positive child outcomes. The Child Care Development Block Grant (CCDBG) is the primary federal grant program that provides child care assistance for families and funds child care quality initiatives. In November 2014, Congress passed bipartisan legislation to promote the safety of children in child care (P.L. 113-186). These new baseline safety and quality measures are to improve the quality of all early care and education programs. To meet these requirements, the State of New Jersey has issued the following provisions that must be met by all child care programs that receive child care subsidy funds. All child care programs that are licensed or registered with the Department of Children and Families, Office of Licensing (DCF, OOL) based on the criteria in the Manual of Requirements for Child Care Centers (N.J.A.C. 10:122) or the Manual of Requirements for Family Child Care Registration (N.J.A.C. 10:126) have received two notifications. Those whose activities involve the care or supervision of children for a child care provider or unsupervised access to children who are cared for or supervised by a child care provider. 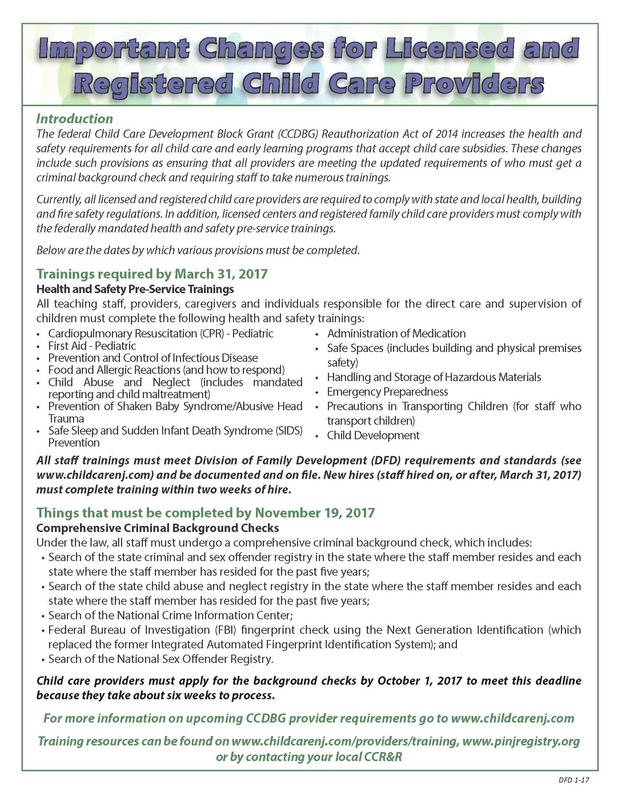 All teaching staff, providers, caregivers and individuals responsible for the direct care and supervision of children must complete all health and safety training by March 31, 2017. New hires, staff hired on, or after, March 31, 2017, must complete the training within two weeks of hire. There has been no extension of the deadline. All child care programs receiving child care subsidy funds must identify that they are attempting to complete the Required Health and Safety Training for CCDBG Reauthorization. A program, staff member, Registered Family Child Care (FCC) provider and Family, Friend and Neighbor (FFN) provider must have begun the training process or must have identified a date that the training will be completed on or by. The Orientation only needs to be completed by new or prospective Registered Family Child Care Home (FCC) and Family, Friend and Neighbor (FFN) providers. All prospective FCC and FFN providers must complete all trainings prior to becoming an approved provider to receive child care subsidies. Where Can Staff Access the Required Trainings? All required trainings (Health and Safety Basics I & II, Child Abuse and Neglect, Child Development and First Aid and CPR) can be accessed through Child Care Resources of Monmouth County. Trainings provided by Child Care Resources are free, classroom-based and meet all the requirements as set forth by the Division of Family Development (DFD). Trainings are being offered at times that are convenient and can meet the needs of child care staff by our Child Care Health Educator/Lead Trainer. Click here to view our Semi-Annual Professional Development Calendar. 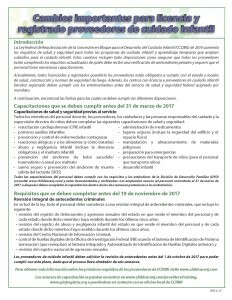 Health and Safety Basics (6 hours) in both English and Spanish can be accessed online at no cost through the State of New Jersey, Department of Human Services, Division of Family Development (DHS, DFD). This online training program can be accessed through http://www.childcarenj.com/Providers/Training. Child Abuse and Neglect (2 hours) can be accessed online at no cost through Prevent Child Abuse New Jersey. This online training program can be accessed through http://www.childcarenj.com/Providers/Training . Child Development (2 hours) can be accessed online at no cost (through April 30, 2017 – please see notice below) and accessed through http://www.childcarenj.com/Providers/Training. The online Foundations of Child Development training (for Child Care Center Teachers and for Family Child Care Providers) through Better Kid Care will continue to be free through Sunday, April 30, 2017. After Sunday, April 30, 2017 you can access the online training for a $5 fee or you can take the instructor-led, classroom-based training for free through Child Care Resources or another CCR&R agency. The deadline for completing training was Friday, March 31, 2017. If you have not completed this training yet, you should do so immediately. After April 30, 2017 detailed instructions will be issued on http://www.childcarenj.com/Providers/Training with how to access the online Foundations of Child Development Training along with directions on paying the $5 fee. 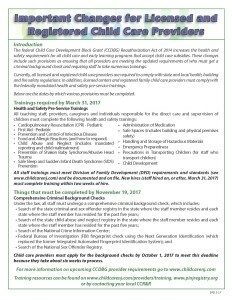 All Required Health and Safety Training for CCDBG Reauthorization at Child Care Resources that instructor-led, classroom-based will continue to be offered at no cost. The online New Jersey Health and Safety Basic Training (6 hour) courses in both English and Spanish will continue to be available at no cost. All directions and instructions for the above online trainings are listed on the website under the course descriptions. Due to many users utilizing the Penn State Better Kid Care website, the servers are experiencing difficulty accommodating the large number of users attempting to log on at various times of the day. All participants are encouraged to try again at a different time of the day and to at least wait 30 minutes prior to attempting to logging back in. Once a participant has accessed the website and if they are experiencing continuing technical difficulties after attempting logging in at a different time, they can contact Better Kid Care for any technical assistance issues that may arise at 1-800-452-9108. Online training programs can be accessed at Child Care Resources’ location in our learning lab. Our computers can be accessed during designated times for staff use to complete the required training. Where Can Staff Access First Aid and Cardiopulmonary Resuscitation (CPR) Training? First Aid and CPR training is required for all teaching staff and individuals must obtain training from Child Care Resources or another training vendor. Training vendors include the American Safety and Health Institute, American Red Cross and the American Heart Society. First Aid/CPR training cannot be completed online and must offer hands-on skills practice. 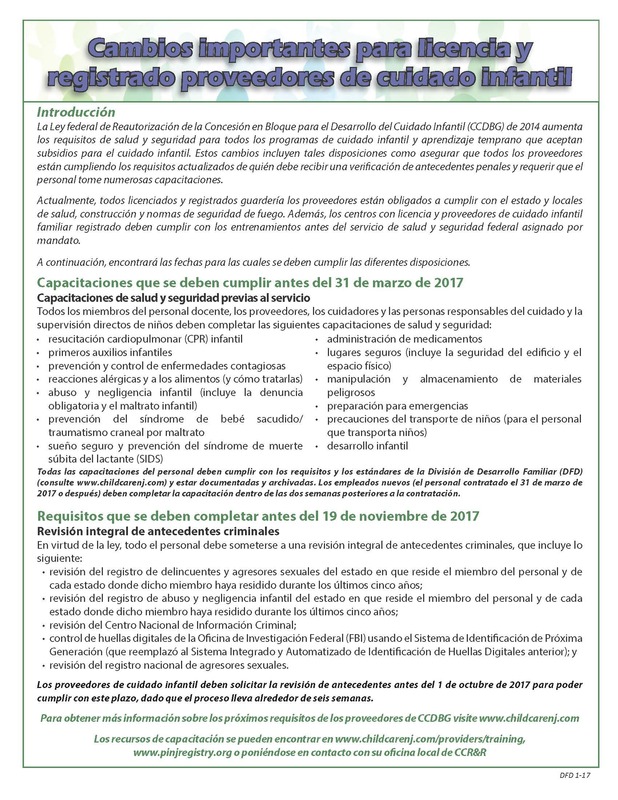 If individuals are currently certified, they do not need to repeat the training to meet the March 31st requirement. Individuals who are currently certified must maintain their certification through recertification courses. How Do Staff Register for Trainings? All participants should register as a member of the NJ Workforce Registry in order to register for training. Participants must become members of or renew their NJ Workforce Registry membership to register for trainings. Child Care Resources staff is available to assist every professional applying to the NJ Workforce Registry. Our agency has available computers to support you during designated hours and by appointment. You can utilize these computers to apply to the Registry and to register for workshops. You can access the NJ Workforce Registry, by clicking here. What are the Ratio and Grouping Requirements that Need to be Met by March 31st? Child care programs must maintain a certain number of staff for the number of children you are serving. For example, if you are a Licensed Child Care Center (licensed by the State of New Jersey, DCF, OOL), you must have one teacher for four children. Under the “grouping requirements,” a specific number of children by age are allowed to be cared for together. To get all of the staffing and grouping requirements, go to N.J.A.C 10:122 – Subchapter 4 – 4.3 and 4.4 – http://www.nj.gov/dcf/providers/licensing/laws/CCCmanual.pdf. For Registered Family Child Care Homes (registered by Child Care Resources), the provider shall care for no more than the following numbers of infants and toddlers unless a second caregiver is present: three children below one year of age; or four children below two years of age, of whom no more than two shall be below one year of age. To get all of the requirements regarding the maximum number of children and the ages of children, go to N.J.A.C. 10:126 – Subchapter 6 – 6.1 and 6.2 – http://www.state.nj.us/dcf/providers/licensing/laws/FCCmanual.pdf. Child Care Resources Is Here To Help! As your local child care resource and referral (CCR&R) agency, Child Care Resources, is committed to supporting you to meet these requirements. We can be available to meet to discuss a training plan that ensures all your staff can meet the requirements. Child Care Resources has evaluated our staff, identified a training calendar and we have determined a plan to best meet both the State’s requirements and to support each type of child care program in Monmouth County. Our staff is available to assist you through each step of this training process. For more information about the State of New Jersey’s child care plan, you can access their website at www.childcarenj.com. For more information about CCDBG and to review the State’s, Department of Human Services, Division of Family Development, Child Care Provider and Information Meeting, “What is New in Child Care?” Presentation 2015. To contact Child Care Resources, please call us at 732-918-9901, Ext. 119 or email info@ccrnj.org with any questions or to set up a meeting or phone consultation.